A rich, diverse Tactical RPG, envisioned by the master of the genre Yasumi Matsuno and you, the fans! 15,824 backers pledged $660,126 to help bring this project to life. It's the first of the month, which means it's Unsung Story update time! Since I didn't give a lot of detail, I made sure to include one very identifiable hint in the background - the Tokyo Tower. So this month's update is going to be framed around my trip to Tokyo where I got to work with some of the main talent behind Unsung Story. Before I start, I wanted to share something that has come up on a couple occasions. For a variety of reasons, sometimes we have to remain quiet about a specific aspect of the game. Taking on Unsung Story involved untangling a legal mess of broken contracts and unpaid partners which has required quite a bit of effort to resolve, and in many of these cases leaves us with no choice but to remain silent. Please know that we will always try to let the backers know as much as we can, but sometimes it's not possible to do that without violating NDAs or jeopardizing the project. With that said, here are the highlights of my trip to Tokyo. On my first day, I spent a lovely evening with Hitoshi Sakimoto and another up and coming composer from his company Basiscape. We ate at a fantastic underground Izakaya restaurant in the Shinjuku part of Tokyo. When I arrived, I was escorted back to a small private room to eat and discuss Unsung Story. I am very excited to announce that Mr Sakimoto and his company Basiscape will be composing and producing 1 hour of original music for the project. We spent much of the evening discussing the story, the world, each school, the characters, and the emotional themes for the game. Afterward I sent over a metric ton of design and story for him to use as inspiration. He's going to be starting with the main theme and then working through the other tracks from there. The following evening I got to see Shibuya, another iconic district in Tokyo. Mr Yoshida couldn't attend the meeting, but I was hosted by several members of Cygames at a local Shabu-shabu restaurant. Dinner was fun, and we hope to work with Yoshida and Cygames in the future. However at this time, due to a number of reasons beyond anyone's control, Mr Yoshida cannot be involved on Unsung Story. We had already started moving forward in the art design, but I wanted to give the backers a definitive answer. We still plan to produce the Unsung Story art book, and we have a couple other ideas to help make up for this change. There was a lot to cover in this meeting, so we decided it would be best to meet at the Westin Tokyo, the hotel where I stayed during my trip. Just prior to flying out I sent over 28 pages of story and design notes along with a Powerpoint presentation walking through our progress in various parts of the project - all fully translated into Japanese. We spent quite a bit of time going through everything using a translator, and he gave excellent feedback. The goal of this meeting was to review our completed story to make sure our American writer had successfully captured all his notes and ideas alongside our other narrative requirements. We also covered aspects of the game design and other elements of the game. The story feedback was great, and much of the meeting was very positive, but he did give one major gameplay note that he wants to see explored. I have already met with the development team, and we're hard at work determining the best way to address it. I have to admit, I had a bit of a fanboy moment at the end of the meeting. Final Fantasy Tactics was instrumental in shaping my future in video games, so meeting Mr Matsuno was an honor. And when it came time to leave, I totally forgot to take a picture with him. Pre-production is scheduled to end in March, so that means we only have 2 more months of milestones before actual production on the game begins. Accordingly January was very busy. Here is a brief look at some of what the team worked on. Class Design v0.20 - We have a second pass on the name and major gameplay mechanics for each class. Version v0.10 was submitted back in December after my trip to Melbourne, and it was solid, but I am even more pleased with this version. The roles between units feel much more defined, while the thematics for each class feel much more unique to our world. You have no idea how much restraint it takes to hold back from sharing some of the class names. Character Art Style Guide v0.10 - This was a fantastic deliverable that took the last couple months of character art concept and modeling and broke the style down so we could apply it to a broader set of characters while keeping consistency in the look. Moving forward without Mr Yoshida means we needed to create our own look and feel that honored the original tactics style without copying it. We've shown a couple concepts, but I like how the style is continuing to evolve. Game Design Document v0.20 - Last month I mentioned the Design Direction document, and this month I got my first look at the GDD. The documents haven't been combined yet, so it's still very incomplete, but it already has all kinds of juicy details on the game flow and combat systems - specifically how damage is calculated and a first pass on all the game stats. World Design v0.10 - This was a new document that we are using to flesh out the world and environments of Unsung Story. Each chapter takes place in a new location, and each location contains a unique school of magic that has influenced that part of the map. Lots of good raw ideas here for clothing, architecture, and other visual aesthetics. We'll be workshopping this document in February, and then making another pass through the story to keep things consistent. Story Design v1.0 - I alluded to this document earlier in this update during my recap of the lunch with Matsuno. I'm excited to say that we're done with the complete first pass! All 5 chapters of the game have a solid narrative that combines Matsuno's original story and characters with some of our new collaborative ideas and filtered through the game's mechanics. It also identifies key mission objectives and encounters. Prototype Build v0.10 - This was an unexpected treat, and all of the work on the GDD made sense when I got this month's playable build with some very rough RPG mechanics. When I say rough, I mean rough. The level is randomly generated with various square bits of geometry - rock, dirt, grass. The scenario contained 5 enemy units and 5 party units with varying levels of health and energy. We're using placeholder robot models for all the units, but they do animate and move. Grid selection, round timing and attack order all worked, and I was able to use a couple basic items to heal units. Right off the bat several enemies grouped up on one of my units who had spawned away from the rest, and they killed him in a quick series of rounds. My other units fared better, as I regrouped and eventually won the battle with 3 units left alive! 3d Mana Attacker test - Lastly, this is one of the super rough 3D tests we did to explore characters in the game. At this point I don't think this actual model will be used, but I feel like we're getting closer. Stay tuned! Lots more in the works. In mid February, we're hoping to starting our Developer Diaries spearheaded by Ash, our lead producer. If we can hold that schedule, then you'll be getting two major updates a month. Thank you for your continued patience and support. Charlie Shannon, James Wherley, and 152 more people like this update. Only just caught up with this project and I have to say you have done an amazing job at reviving this game! Read all your updates since August last year and it made for an incredible read! Good luck going forward, I'm looking forward to play your game. I'd still rather have my $250 back then see anymore updates on this project. Thanks for another great update! Glad to hear that Sakimoto will be working on the game again, and that Matsuno was willing to meet and talk. Excited for March! Man, you guys and your incredible powers of necromancy. I'd written this game off entirely and here I am looking forward to every update again! I would not have been critical if you'd really just decided to break from much more of the games roots but going to Japan to consult related parties is way more than I expected and that is awesome. Keep it up! I know you're in a more difficult spot than the vast majority of games but sometimes challenges just give rise to better things! Also I want to mention that you should definitely hire a Japanese artist to help out with character design. That's a HUGE part of the game (it's what you're showing to customers) and if you want it to be spiritual successor to FFT then it should at least look like a JRPG. A Japanese artist will know how to emulate or design a style that fits well with the FFT design you should be going for. Great update! It was a wonderful read. And to be honest, I don't like the model or the direction of the art. I would hope you'd aim at something more darker and very Japanese-styled. Of course you can make your own style but you said you wanted the look to be faithful to tactics so I think it definitely needs adjustments. Atm the 3D model looks more like a model for a Pixar movie than a model for a Japanese-style RPG. Though I wish you had gone with 2D sprites and that would solve most of the issues. Best of luck. Very excited to hear that Sakimoto is on board again. Excellent work! 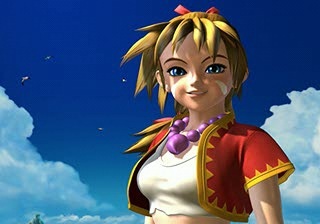 The character model reminds me of Kid from Chrono Cross (https://rpgsquare.files.wordpress.com/2011/11/chrono-cross-kid-smiling.jpg). She was designed to look like a teenage girl (16?). If that's the goal with these characters, you're heading in the right direction. But remember that in Tactics, only a few of the characters were that young. I'm curious what the visual hook is for the art direction. Yoshida is famous for drawing characters without noses. What will Unsung Story have to set it apart? pretty excited about the hour of sakimoto music - his work on Tactics and Vagrant Story played a huge part in sticking those games in my memory. I still listed to the VS soundtrack occasionally. I'm glad you're having a good time. BTW, has anything actually gotten accomplished on the game, or are you still in the "planning phase"? It's so exciting that this game is finally being made! Years of lies washed away in a handful of updates. I hope there'll be a nice little jab at the original devs hidden in a sub quest somewhere, but I doubt it. Loving the work you are putting into this! It's mostly very professional PR rather than something substantial, but, man, I can't help but get optimistic and even excited about Unsung all over again. Never thought this could happen. Cool. I'd long since given up on the money I spent here, but it looks like the game might actually happen after all. Great work, great communication. Thank you. You've done a brilliant job since taking over, especially when it comes to keeping everyone informed. I think and hope that all the hard work you're doing now will help to restore the excitement for this project (which for me is seeing something connected to Matsuno come to life) and in the end, the sales. Obviously I would agree with some of the other commenters that I love the artwork in previous Matsuno games, but whatever "look" you go for, you should try to make it your own and have confidence in your abilities. (I would just gently caution against going for a Vandal Hearts: Flames of Justice style). So good to see this project finally taking form. I also want to comment on how great the work you guys have done. It is great to see this project actually going somewhere. Keep up the good work. I also want to comment on the character design. I like the design for this model more than some of the others I have seen so far. But it would be cool if the face on the 3D had a more cute anime/cartoon-ish face than than the one it has now. Thank you for the update, however it saddens me to hear that Mr. Yoshida cannot be involved in the project as it was a major impetus for my backing; it does put a large damper on my excitement to see this project finally making progress once again. That said, I'm glad progress is being made, and I'm glad for the regular updates. I can't say I'm a fan of the model used there, but I think the costume design is fine, the execution is just a little off from expectation. Fantastic update! Great to see the progress and transparency (when able to share of course). I agree with the other commenters, im not sure what the correct direction is but yeah something seems a bit off with the character model, but then again if you showed me FFTs artwork at this stage id probably yell at you for lack of noses, so what do I know! Thank you for the great update. Happy to hear about Sakimoto being on board and that you had a positive meeting with Matsuno. Very hype to hear that Sakimoto and his team are going to end up composing the music after all. I got to say. I had given up on this project long ago and pretty much assume my money is lost. You sir have given me hope once again. I look forward to the good work you and your team is working on! I look forward to future updates! I had written this project of well over a year ago, if not longer. And frankly when news of the change in developer came though I breifely thought about finding a way of unsubscribing from further updates. I remember someone on the original project saying something along the lines of “ they were under a lot of pressure not to fail” and every time I think of that remark it would anger more more than any other failed crowdfunded project I have backed so far. How dare you get my hopes up with this latest update. I hate that I’m actually a little bit excited and hopeful this project might finally actually happen. Definitely getting excited again! The one piece of feedback id like to leave about the artwork so far is that it’s FAR too American/Western looking for a Japanese style game. Looks a bit more like Saturday cartoons than a stylish anime (or the god-tier levels of Yoshida.) but I have faith that you guys will find the right look! I still can’t express how happy I am that you guys took over this project. The communication is really night and day. I’m excited to see what the final project (or even just some alpha gameplay will look like. Keep up the great work! This update has me seriously hype for this game I previously lost some passion for. Really appreciate you keeping us posted. One piece of feedback: I'm really not a big fan of the design for the Mana Attacker Model. It looks very cartoony (like something out of a Barbie game for the DS). I know it might not be possible, but I'd prefer something more like the original concept art.